Soon it will be New Year’s Day – the first day of 2014, with a whole calendar of days ahead to fill. Australians have something else to celebrate: the 113th anniversary of the Federation of Australia, which took place on January 1 1901. Federation was the process by which the six British colonies of New South Wales, Victoria, Queensland, Tasmania, South Australia, and Western Australia were united as one nation – the Commonwealth of Australia. Unfortunately, we don’t celebrate this momentous occasion, having stayed up late New Year’s Eve, and we already have a public holiday anyway, so instead Australia Day is our national holiday. The movement towards Federation began in the late 19th century, when enough people had been born in Australian to identify as “Australian” rather than British (even though they were still British subjects). Nationalism was celebrated in songs and poetry, with Banjo Paterson one of the poets who led the way, and technology had improved enough that people could travel and communicate across the country. Despite this, it was hard to get everyone interested in being federated, as there were so many issues to resolve. At one time, it was thought New Zealand and Fiji might want to join, but for some reason they didn’t (New Zealand showed interest, took a raincheck and never called us back). Smaller colonies were convinced that big ones like New South Wales and Victoria would end up running the show, while the labour movement worried that it might distract everyone from industrial reform. There was also the problem of what model we were to follow in federating the colonies. The United States had managed to unify their colonies – but they did so through a bloody revolution, and becoming a republic. Canada seemed a promising candidate, but it was thought to be too highly centralised, which brought out the paranoia of smaller colonies all over again. Switzerland was another possibility, but it had pretty much followed the American model anyway. In the end, the United States was the obvious model, and we did a bit of a mix-and-match – using the US Constitution as a guide, while retaining the Westminster system, and passing on the revolution and the republic. Like the United States, Australia leaves a few big things in the hands of the federal government, while allowing the states the freedom to handle a whole raft of smaller things. We both have a Lower House and a Senate, and the most obviously American thing of all – our colonies became states, not provinces or cantons or counties or regions or departments. One of the early supporters of Federation was a New South Wales lawyer and politician named Edmund Barton (Toby to his friends since childhood, for reasons I have been unable to ascertain). Barton had early on shown political promise when he umpired a cricket match between England and New South Wales which turned ugly, resulting in international cricket’s first riot (Banjo Paterson was amongst the rioters who invaded the pitch). Barton showed presence of mind in defusing the situation, and it is thought this helped him first become elected to the Legislative Assembly. Barton was leader of the federal movement in New South Wales, and addressed nearly 300 meetings in both city and country, helped draft the Constitution, travelled to London to explain the federation bill to the British Government, and campaigned for federalism when the issue went to referendum. It was a total no-brainer to practically everyone that when a caretaker Prime Minister was appointed, it should be Barton, the leading federalist of the oldest state. However it wasn’t quite so clear-cut to the first Governor-General, Lord Hopetoun, who asked the Premier of New South Wales, Sir William Lyne, to become the first Prime Minister. He doesn’t seem to have asked anyone’s opinion or gauged the public mood, and everybody had a fit, because Sir William had been the main opponent of federalism until he suddenly changed sides at the last minute once he realised that federation was definitely happening. Hopetoun blindly followed the protocol used by Canada, and it was such a disastrous decision that it has gone down in history as The Hopetoun Blunder. 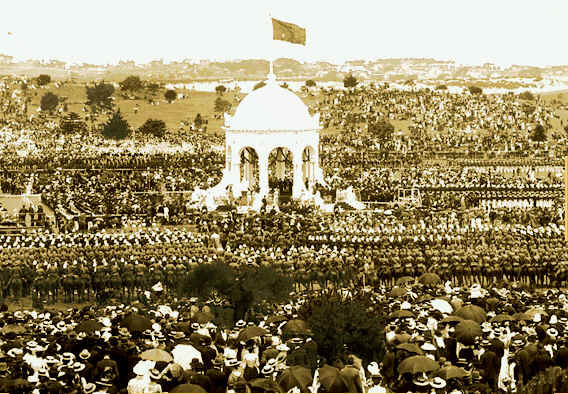 After some rather tense negotiating, Lyne handed back his commission and Hopetoun swore Edmund Barton in as Australia’s first Prime Minister in Centennial Park, Sydney, on New Year’s Day 1901, and all his ministry as well – which included Sir William Lyne as Minister for Home Affairs. One of the first tasks was to organise the first general election, which took place on March 29-30, and was different to today’s elections – voting was voluntary (about 60% voted), the first-past-the-post system was used, and every state had its own laws, so in some places women and Aborigines were allowed to vote, and in others they weren’t. No party won outright, but Barton’s Protectionist Party was able to govern with the support of the Labor Party, and it was felt that the nation’s first election had gone extremely well. I remember some years ago (I think for the Centenary of Federation), there was a television advertisement which noted that many Australians didn’t know who their first prime minister was, although most knew that George Washington was the first president of the United States. Rather than decrying this failure in our education, the advertisement tried to make it seem like a good thing – apparently the lack of war made our first prime minister’s name forgettable. Which is nonsense: plenty of other countries gained their first leaders without bloodshed, and I’m sure they know who they were. The Australian citizenship test used to ask who the first prime minister was, but this is no longer required. Feeble. (The US citizenship test still asks who the first US president was). No excuses – all Australians should know Edmund Barton was our first PM. Barton is an English surname which comes from places named Barton in Lancashire, Staffordshire, Yorkshire and Kent, meaning “barley farm” in Old English. The one in Lancashire seems to be the earliest source of the surname. Barley was one of the first grains ever domesticated, and a staple food for peasants during medieval times. In fact, the word barn means “barley house”. You may recall that A.B. “Banjo” Paterson, national poet and cricket rioter, was related to Edmund Barton through his mother, who was born Rose Barton. Paterson’s initials stood for Andrew Barton, and as his father was named Andrew, he went by his middle name, being known as Barty to his friends. The name Barton would be a good way to honour not only our first prime minister, but our favourite poet as well. You could use the Simpsonian Bart as the nickname, but I favour Paterson’s choice of Barty, which fits in with popular choices like Archie. POLL RESULT: Barton received an approval rating of 53%. 29% of people thought it was a good name, but nobody loved it. I knew a Barton in primary school. He was born in 1986 so his name really stood out amongst a sea of Tim’s, Andrew’s, Robert’s and James’s. He had a sister called Annabelle (another name that also stood out) – I always thought it was a nice sibset. Thanks for commenting Kay – that’s really interesting, especially as Annabelle wouldn’t stand out at all now. Perhaps Barton could also become a mainstream choice in the future.